On the 7 of March 2019, the version 6.0 of the ISC-GEM Catalogue was publicly released. The release marked the end of the first year of the Advancement Project . During this year we added to the catalogue a) 623 earthquakes that occurred in 2015 with magnitude 5.5 and above plus continental earthquakes with magnitude 5.0-5.5; b) 7012 earthquakes during the periods 1964-1979 and 2000-2014 that include both continental events with magnitude 5.0-5.5 and events around the magnitude cut-off threshold of 5.5 that were not selected before (i.e., earthquakes not included in the catalogue’s previous versions). In addition, we expanded the catalogue files to include also the nodal planes for earthquakes with GCMT solution as well as source mechanism from the literature for those earthquakes with direct M0 from the bibliographic search of reliable seismic moments (see Lee and Engdahl, 2015). In total, we added 385 source mechanisms from the literature. The list of publications used to retrieve direct seismic moments and source mechanisms is available at http://www.isc.ac.uk/iscgem/mw_bibliography.php. Additional changes to the catalogue are listed in the update log. Fig. 1 shows the ISC-GEM locations with symbols according to Agnew (2014) as obtained from the procedure described in Bondár et al. (2015). One feature that makes the ISC-GEM Catalogue a unique product is that the locations are achieved by the same location technique and velocity model (ak135) and comes with uncertainties for each focal parameter. Fig.1: map showing the earthquakes listed in the Version 6.0 of the ISC-GEM Catalogue (nearly 36,000 earthquakes, see Fig.2). The symbols are plotted according to Agnew (2014) and colour coded according to the ISC-GEM depth. Fig. 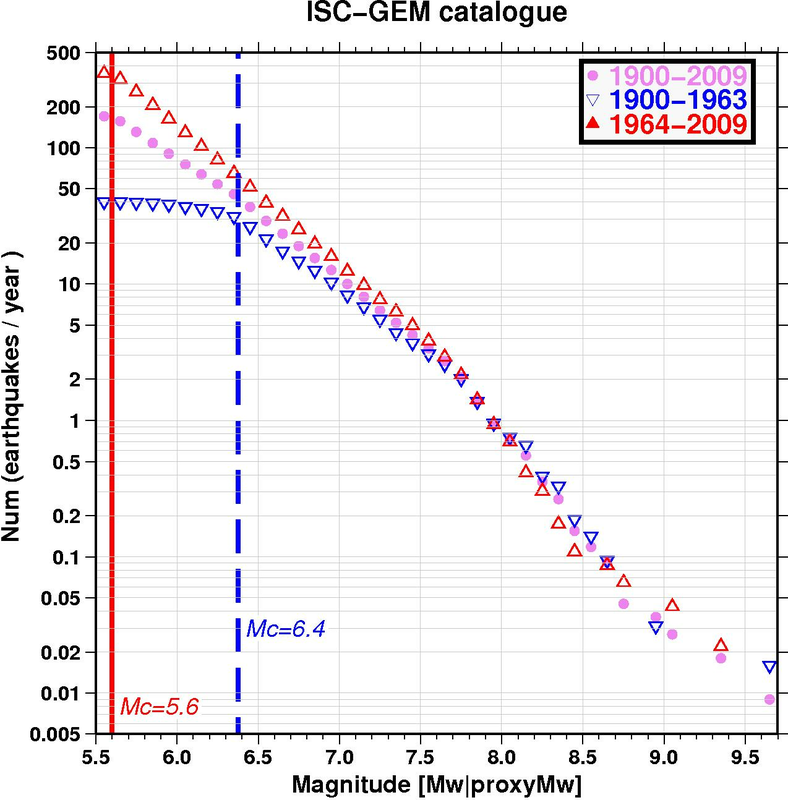 2 shows the current time-magnitude distribution of the ISC-GEM Catalogue (1904-2015). Fig. 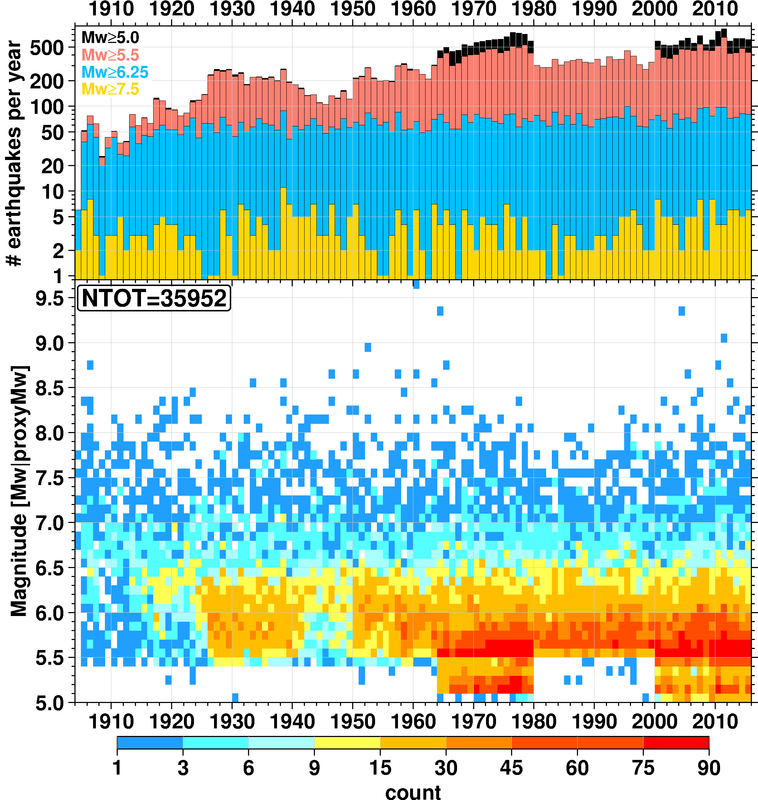 2: Top: cumulative annual number of earthquakes with Mw ≥ 5.0 (black), Mw ≥ 5.5 (red), ≥ 6.5 (blue) and ≥ 7.5 (yellow); Bottom: time-magnitude distribution color-coded in cells of 0.1 units of Mw for each year of the ISC-GEM main catalogue. The earthquakes processed in 2015 exhibit the same distribution we can observe in recent years and add significant earthquakes to the catalogue. The biggest difference with previous versions occurs during 1964-1979 and 2000-2014, where, in the past versions, nearly no earthquake below Mw 5.5 was included. For comparison with the original version see Fig. 20 in Di Giacomo et al. (2015b), or Figure 25 in Di Giacomo et al. (2018) for the comparison with Version 5.0. On the 27 of February 2018, the version 5.0 of the ISC-GEM catalogue was publicly released. The release marked the end of the fourth year of the Extension Project. During this year we added to the catalogue a) 1110 earthquakes that occurred between 1904 and 1919 (i.e., earthquakes not included in the catalogue’s previous versions); b) 521 earthquakes with magnitude 5.5 and above that occurred in 2014. To process earthquakes during 1904-1919 we digitized body wave arrival times as well as amplitudes and periods for various phases using a multitude of sources to allow relocation and magnitude re-computation (for this time period only MS) using the same approaches described in Di Giacomo et al. (2015a). Compared to the first catalogue’s release, for this version we were able to add amplitudes from printed station bulletins that were not available in the original ISC collection. The additional station bulletins were kindly provided from the personal collection of Prof. N. Ambraseys, British Geological Survey (BGS) collection, bulletins from the Geophysical Institute of the Czech Academy of Sciences in Prague, the Geophysical Survey of the Russian Academy of Science in Obninsk and the University of Strasbourg (France). Such an enriched bulletin collection allowed us to add important surface wave amplitudes from different stations and to obtain for the first time MS for many historical earthquakes and to improve the MS for large earthquakes (MS>6.0) for earthquakes that were already listed in previous versions of the ISC-GEM catalogue. Fig. 1 shows the ISC-GEM locations with symbols according to Agnew (2014) as obtained from the procedure described in Bondár et al. (2015). One feature that makes the ISC-GEM catalogue a unique product is that the locations (after 1903) are achieved by the same location technique and velocity model (ak135) and comes with uncertainties for each focal parameter. 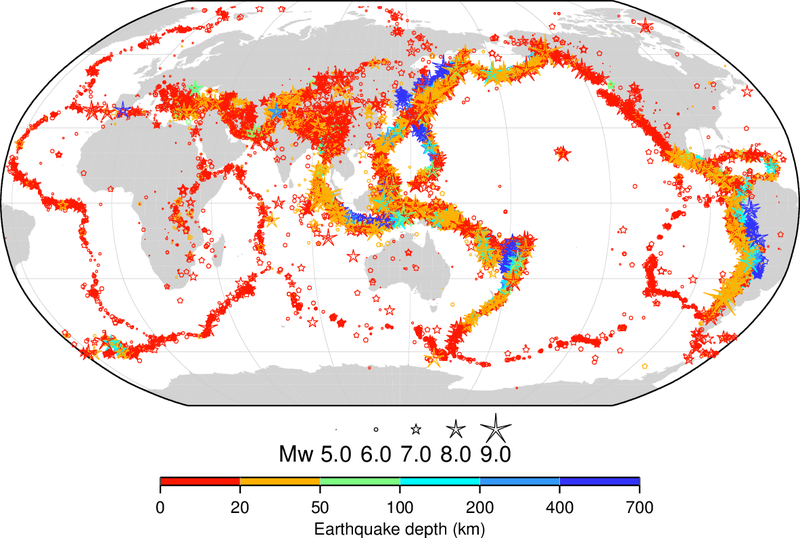 Fig.1: map showing the earthquakes listed in the version 5.0 of the ISC-GEM catalogue (more than 28,000 earthquakes, see Fig.2). The symbols are plotted according to Agnew (2014) and colour coded according to the ISC-GEM depth. Fig. 2 shows the current time-magnitude distribution of the ISC-GEM Catalogue (1904-2014). Fig. 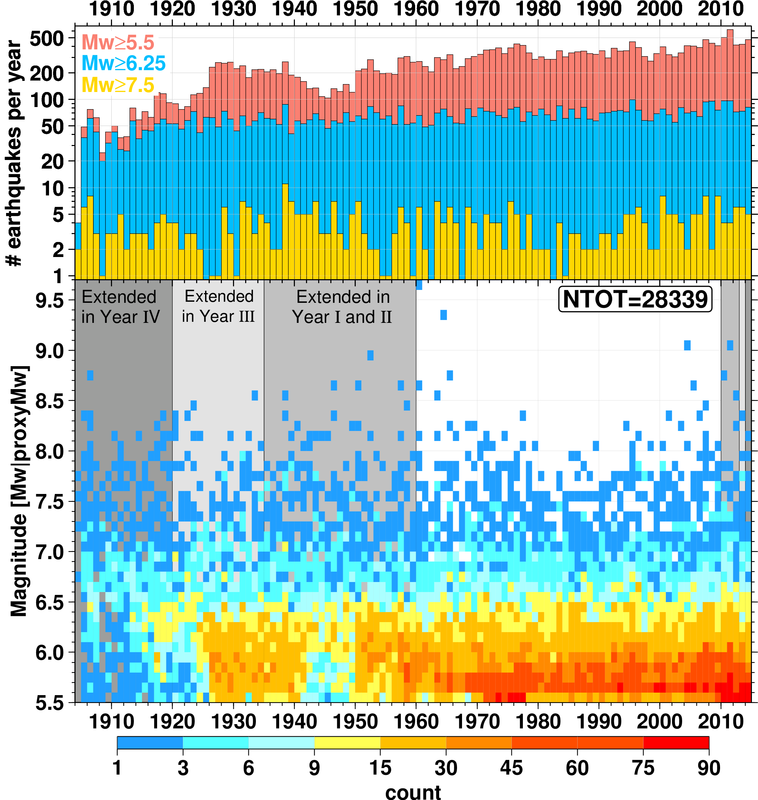 2: Top: cumulative annual number of earthquakes with Mw ≥ 5.5 (red), ≥ 6.5 (blue) and ≥ 7.5 (yellow); Bottom: time-magnitude distribution color-coded in cells of 0.1 units of Mw for each year of the ISC-GEM main catalogue. The earthquakes processed in 2014 exhibit the same distribution we can observe in recent years and add significant earthquakes to the catalogue. The biggest difference with previous versions occurs during 1904-1919, where, in the past versions, nearly no earthquake below Mw 7.5 was included. Both the time-frequency distribution and the annual number of events per year above 5.5 show, however, that in the 1904-1919 the ISC-GEM catalogue is not as complete as in the more recent decades. The shaded light grey areas highlight the years extended or added. For comparison with the original version, see Fig. 20 in Di Giacomo et al. (2015b). On the 26 of January 2017, the version 4.0 of the ISC-GEM catalogue was publicly released. The release marked the end of the third year of the Extension Project. During this year we added to the catalogue a) earthquakes listed in the ISS with phase data and surface wave amplitude measurements that occurred between 1920 and 1934 (i.e., earthquakes not included in the catalogue’s previous versions); b) earthquakes with magnitude 5.5 and above that occurred in 2013. To process earthquakes during 1920-1934 we digitized body wave arrival times as well as amplitudes and periods for various phases using a multitude of sources to allow relocation and magnitude re-computation (for this time period only MS) using the same approaches described in Di Giacomo et al. (2015a). Compared to the first catalogue’s release, for this version we were able to add amplitudes from printed station bulletins that were not available in the original ISC collection. The additional station bulletins were kindly provided from the personal collection of Prof. N. Ambraseys, British Geological Survey (BGS) collection, bulletins from the Geophysical Institute of the Czech Academy of Sciences in Prague, the Geophysical Survey of the Russian Academy of Science in Obninsk and the University of Strasbourg (France). Such an enriched bulletin collection allowed us to add important surface wave amplitudes from different stations and to obtain for the first time MS for many historical earthquakes and also to improve the MS for large earthquakes (MS>6.0) for earthquakes that were already listed in previous versions of the ISC-GEM catalogue. 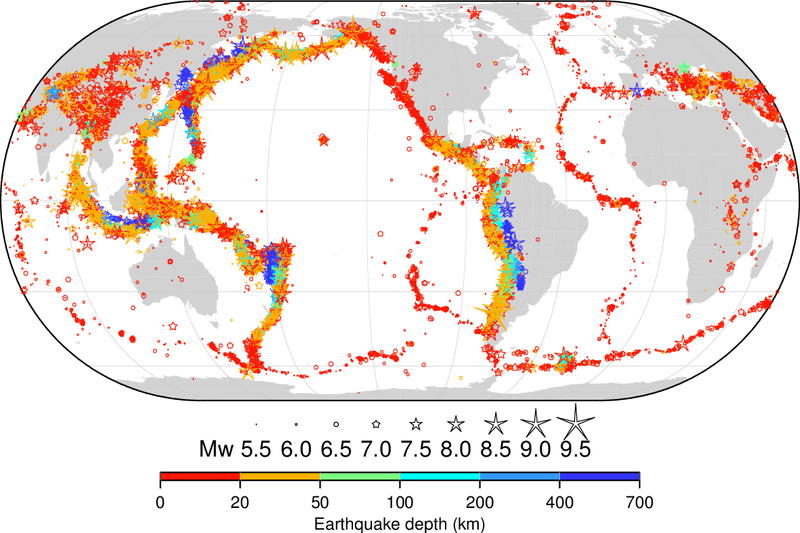 Fig.1: map showing the earthquakes listed in the version 4.0 of the ISC-GEM catalogue (more than 26,000 earthquakes, see Fig.2). The symbols are plotted according to Agnew (2014) and colour coded according to the ISC-GEM depth. Fig. 2 shows the current time-magnitude distribution of the ISC-GEM Catalogue (1900-2013). Fig. 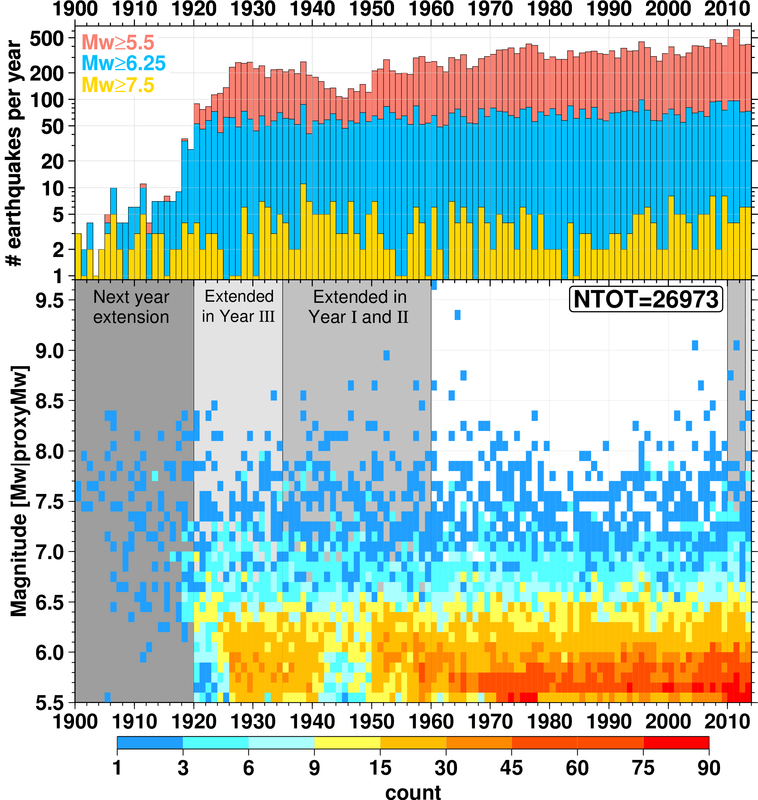 2: Top: cumulative annual number of earthquakes with Mw ≥ 5.5 (red), ≥ 6.5 (blue) and ≥ 7.5 (yellow); Bottom: time-magnitude distribution color-coded in cells of 0.1 units of Mw for each year of the ISC-GEM main catalogue.. The earthquakes processed in 2013 exhibit the same distribution we can observe in recent years and add significant earthquakes to the catalogue. The biggest difference with previous versions occurs during 1920-1934, where, in the past versions, nearly no earthquake below Mw 6.1 was included. Both the time-frequency distribution and the annual number of events per year above 5.5 show, however, that in the 1920-1934 the ISC-GEM catalogue is not as complete as in the more recent decades. The dark shaded grey area before 1920 is the time period that will be processed in the remaining year of the Extension Project, the shaded light gray areas highlight the years extended or added. For comparison with the original version, see Fig. 20 in Di Giacomo et al. (2015b). On the 28 of January 2016, the version 3.0 of the ISC-GEM catalogue was publicly released. The release marked the end of the second year of the Extension Project. During this year we added to the catalogue a) earthquakes listed in the ISS with phase data and surface wave amplitude measurements that occurred between 1935 and 1959 (i.e., earthquakes not included in the catalogue’s previous versions); b) earthquakes with magnitude 5.5 and above that occurred in 2012. To process earthquakes during 1935-1959 we digitized body wave arrival times as well as amplitudes and periods for various phases using a multitude of sources to allow relocation and magnitude re-computation (for this time period only MS) using the same approaches described in Di Giacomo et al. (2015a). Compared to the first catalogue’s release, for this version we were able to add amplitudes from printed station bulletins that were not available in the original ISC collection. The additional station bulletins were kindly provided from the personal collection of Prof. N. Ambraseys, British Geological Survey (BGS) collection, bulletins from the Geophysical Institute of the Czech Academy of Sciences in Prague, the Geophysical Survey of the Russian Academy of Science in Obninsk and the University of Strasbourg (France). Such an enriched bulletin collection allowed us to add important surface wave amplitudes from different stations and to obtain for the first time MS for many historical earthquakes and also to improve the MS for large earthquakes (MS>6.0) for earthquakes that were already listed in previous versions of the ISC-GEM catalogue. 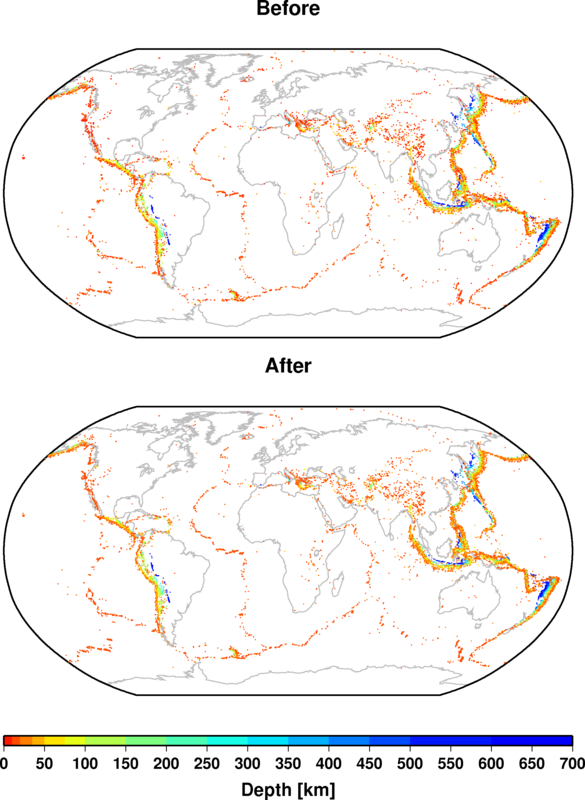 Fig.1: map showing the earthquakes listed in the version 3.0 of the ISC-GEM catalogue (more than 24,000 earthquakes, see Fig.2). The symbols are plotted according to Agnew (2014) and colour coded according to the ISC-GEM depth. Fig. 2 shows the current time-magnitude distribution of the ISC-GEM Catalogue (1900-2012). Fig. 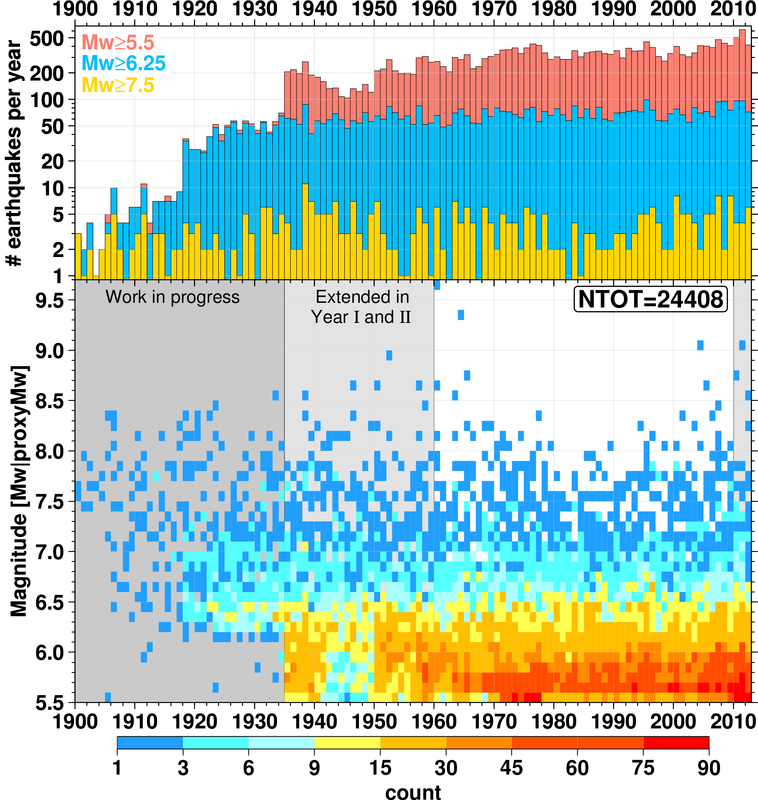 2: Top: cumulative annual number of earthquakes with Mw ≥ 5.5 (red), ≥ 6.5 (blue) and ≥ 7.5 (yellow); Bottom: time-magnitude distribution color-coded in cells of 0.1 units of Mw for each year of the ISC-GEM main catalogue. The shaded dark grey area before 1935 is the time period that will be processed in the remaining two years of the Extension Project, the shaded light gray area highlights the years extended in Version 3.0. For comparison with the original version, see Fig. 20 in Di Giacomo et al. (2015b). The earthquakes processed in 2012 exhibit the same distribution we can observe in recent years and add significant earthquakes to the catalogue. The biggest difference with previous versions occurs during 1935-1949, where, in the past versions, nearly no earthquake below Mw 6.1 was included. Both the time-frequency distribution and the annual number of events per year above 5.5 show, however, that in the 1935-1959 the ISC-GEM catalogue is not as complete as in the more recent decades, especially for the 1940s due to data loss during World War II. The shaded area up to 1934 outlines the time period that will be processed in the next two years of the Extension Project. 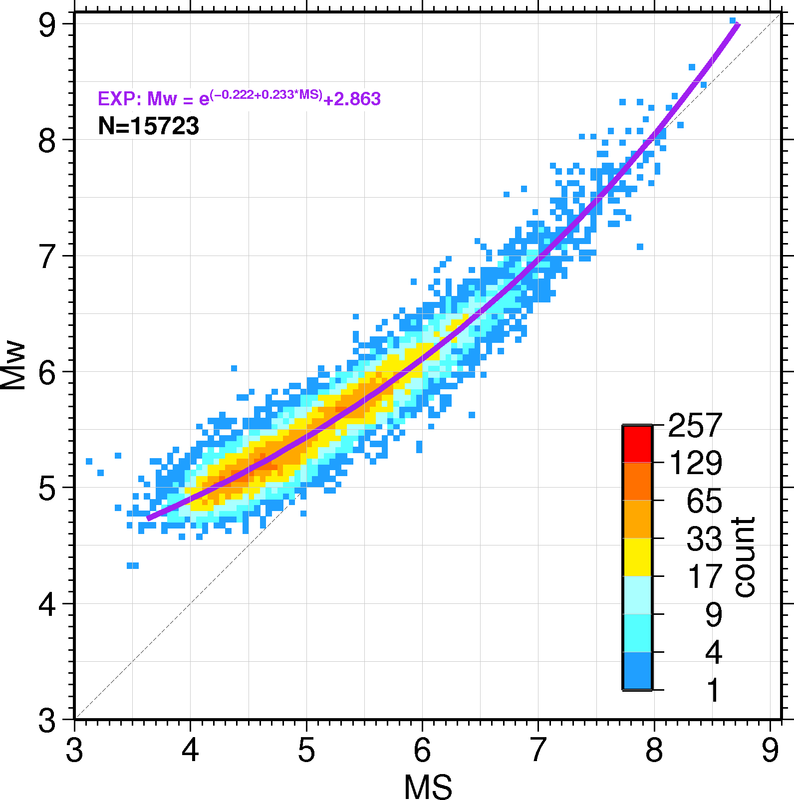 magnitudes expressed in Mw scale with uncertainties, based on seismic moment, where possible; proxy Mw were used in all other cases based on the newly developed empirical relationship with Ms and mb. As can be seen from the Figure 2, the ISC-GEM catalogue features hypocentre solutions (after 1903) achieved by the same location technique and velocity model. It also greatly benefits from the earthquake size expressed in the same scale (Mw ) with only four approaches used to compute Mw values (Fig. 3). Figure 2. 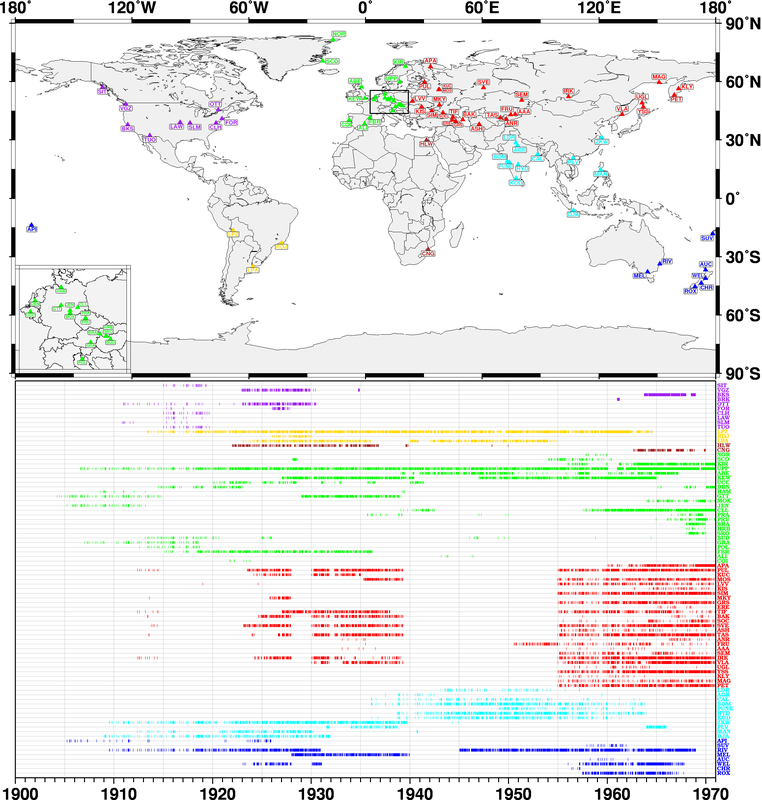 The change in the view of global seismicity following the advent of the ISC-GEM Catalogue; comparisons are made against the best available solutions in the ISC database prior to the start of this project. Notably, all events in the ISC-GEM Catalogue after 1903 were relocated using the same technique and velocity model. Figure 3. Improvement in homogeneity of the earthquake magnitude measurements; just four sources of MW determination in the ISC-GEM Catalogue compare favourably against a multitude of magnitude types, determination techniques and sources used in the Centennial Catalogue (Engdahl and Villaseñor, 2002). M0 and Mw from selected reviewed scientific literature. Table 1. Electronic availability of seismic parametric data prior to the start of the project. all phases predicted by the ak135 velocity model are used to constrain hypocentres. Figure 4. 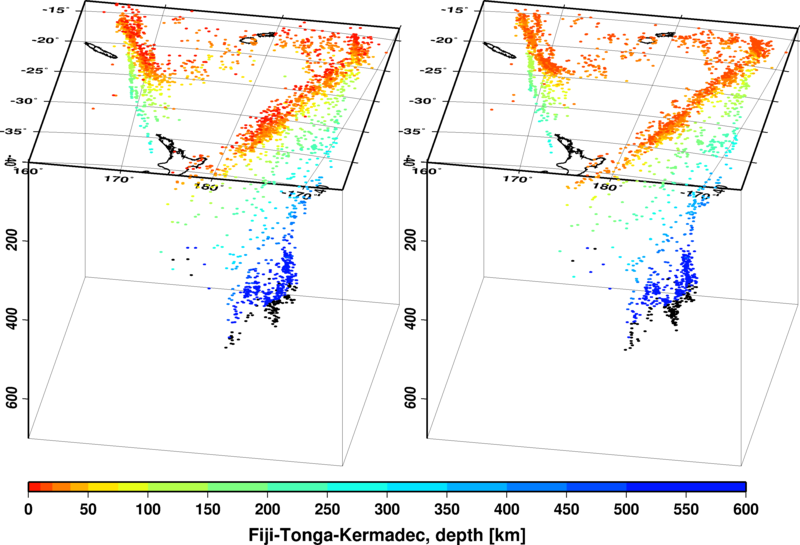 An example of improvement of previous event locations in the Fiji-Tonga-Kermadec region (left) as a result of this project is seen in much tighter clustering of events (right) illuminating specific tectonic features. Figure 5. An Ms/Mw regression was developed during this project based on the wealth of recent GCMT Mw and ISC-GEM Ms magnitude determinations. Each event in the Catalogue is characterised by a magnitude expressed in Mw scale with an uncertainty. Bibliographical search of scientific articles (1900-1979) that feature a reliable estimation of M0. Proxy Mw were used in all other cases (the majority), based on the newly developed empirical relationships (Fig. 5) with Ms and mb. All Ms and mb were re-computed using the original amplitude and period measurements. Notably, the main source of data for the first part of the 20th century, the ISS Bulletin, does not contain amplitude measurements or magnitude estimates. We had to source those from the original paper-based station and network bulletins stored in the ISC warehouse and other collections. We used the seismic wave amplitude and period data reported by the quality seismic stations that operated for long periods of time (Fig.6). Figure 6. The map and the timeline of seismic stations for which additional data have been manually entered and used for computation of the Ms and mb magnitudes. Figure 7. Magnitude frequency distribution of earthquakes in the ISC-GEM Catalogue within different periods of time. Due to the comparatively small number of events in the Catalogue it is hard to assess magnitude completeness on a regional basis. On a global scale we observe a change of completeness Mc from 5.6 to 6.4 (Fig. 7) before and after 1964. This, of course, is a direct result of the change in the cut-off magnitude that, in turn, is related to the start of the ISC operations and the corresponding massive increase in parametric data availability. Seismicity rates for large (M>7.5-7.6) earthquakes are best assessed considering the entire time window. For moderate earthquakes the modern period is a better basis for magnitude-frequency studies. We suspect that a pronounced dip in the magnitude frequency curve at large magnitudes reflects the fact that the 110 year period is still not representative enough to account for statistics of very large earthquakes.